For my very first blog post, I wanted to touch upon a topic that I care a great deal about: the relationship of power between media and us. In one particular reading for my journalism class that stuck with me, communications theorist Barbie Zelizer says that studies of journalism have not done enough to explain why we, the public, give journalists the authority to tell us what is happening in the world. Zelizer uses the term “media power” to describe how omnipresent, unquestioned, and trusted journalists usually are, pointing out that reporters typically use their job to criticize every powerful and elite establishment in society except their own. Perceived journalistic authority is, of course, not a purely American phenomenon. News is made and reported everywhere in the world. It is an American trend, however, or at least a Western one, as Zelizer notes, to examine the phenomenon of journalistic authority in strictly sociological terms. Zelizer calls for a more “interdisciplinary” approach to exploring how and why news functions the way it does for both journalists and their audiences. Sociology alone is not enough, she says. Zelizer’s argument is a powerful one. It’s sensible, and probably on the popular side of things. It fits perfectly with the modern school of academic thought, the one that relishes how interdisciplinary academic fields have become and strive to become, and how this interdisciplinarity can help everyone better understand and predict the complexities of real life, which have always been too much for cordoned-off disciplines to handle on their own. But — and perhaps this is the (modified) sociologist in me talking — I think sociology, a single discipline (though admittedly a very versatile one), in this case does a fine job of getting to the root of matters. In particular, I’m looking at the various influential theories on power and authority made famous by sociologist Max Weber. Weber famously held that there are three basic kinds of authority: traditional, charismatic, and legal-rational. We listen to figures of traditional authority because we always have; we listen to figures of charismatic authority because these figures are popular and compelling; and we listen to figures of legal-rational authority because they represent ideals that are commonsensical or in accordance with laws of the land. (A fourth type, “good authority,” is based upon perceived expertise, but this is often excluded from the canon.) There are problems associated with all three rationales, most clearly with the first two. But Weber’s main point, as is Zelizer’s, is that no entity obtains power that is not given to it. So where does the public’s bulletproof faith in journalism — Zelizer’s “media power” — fall in relation to Weber’s categories? In a Venn diagram, likely in the place where all three circles overlap. 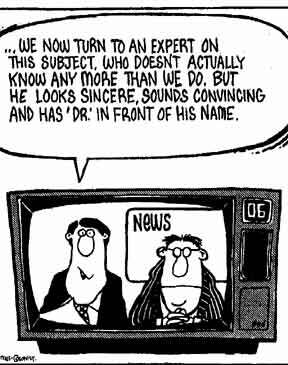 Traditional, charismatic and legal-rational authority are all at work with regard to our trust in the media to report accurately, objectively and frequently on topics we deem relevant to our lives. We trust media representatives to understand what we think is important. We listen to journalists because we always have; we listen to them because it makes sense to listen to them (why not get the news from people who are professionally devoted to finding and reporting it? ; and sometimes we listen to them just to hear specific personalities like Katie Couric or Anderson Cooper, who many find intriguing on a personal level despite constant debate about their journalistic competence. But if this blog counts as a form of media, why listen to me? Decide for yourself if you think I and my colleagues base our authority in all three of Weber’s paradigms.